The Floating City of Venice, Italy is settled among the Venetian Lagoon in the form of many smaller islands. 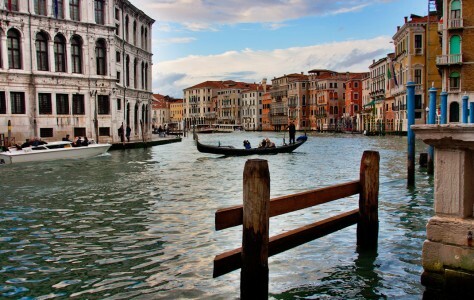 Its famous gondoliers used to be the primary method of moving around the canals, but this historic method of transportation is now reserved as a tourist attraction or for weddings and other happy events. The majority of the population move around Venice by using the vaporetti (water buses). You can take one of the gondola rides on a tour across Venice, as shown in this jigsaw puzzle, and your licensed gondolier will ensure you have an unforgettable experience as you float across this dazzling city. Credit: Special thanks to Andrés Nieto Porras for making the photograph used for this jigsaw puzzle available through the Creative Commons Attribution ShareALike license. Visit Andrés Nieto Porras's Flickr photostream. See all jigsaw puzzles based on Andrés Nieto Porras's photographs.